The troubled Botswana Amateur Fencing Society (BAFS) held its national championships in Gaborone this past weekend. The championships marked the end of the tumultuous 2017 calendar for the fairly new sport code. BAFS has had its fair share of controversy this year with a divided committee that spilled over to affect affiliates. Nevertheless, the last BAFS event of the year dished out some entertaining duels. One of the most entertaining matches featured the 2014 Africa youth games athletes being Aobakwe Modise and Thabile Pilane. The two athletes met in at BAFS senior women finals. The senior women epee category was an entertaining student vs. Master duel were Aobakwe Modise against her apprentice Thabile Pilane. The student versus teacher clash saw Modise emerge as winner against Pilane who is also her teammate. Modise who is among the three local fencing masters locally proved to be a level above her opponent. “I still want to play as opposed to coaching. I want to be an Olympian,” said the ambitious Modise. Pilane lost the match 16-15, though she defeated her master 5-3 during the pool stage. “We always give each other competition. I am hoping to do well in the future,” explained the 2014 Africa Youth Games quarter finalist. Pilane is positive that she will soon become a master by beating her mentor. Boikobo Nkwe got a gold medal without competing due to shortage of competitors. “I was playing against boys, I think I did very well though I lost all games,” said Nkwe. The 20 year old Tlokweng based athlete expressed disappointment over winning gold after failing to get an opponent. Chape confirmed that Boikobo walked through to the finals because she did not have opponents on the day. Meanwhile BAFS technical director Stan Chape said the tournament went well even though attendance was poor on the day. Moreover Chape explained that internal politics at BAFS affected their calendar of events negatively as BNSC suspended their activities at one point. “We were placed on hold by BNSC for some time due to unforeseen circumstances, this is our second tournament this year,” explained the BAFS TD. Chape is however hopeful that they will have another tournament before the end of the year. BAFS has about seven affiliated clubs, mostly academies and schools. Fencing has four age categories, which includes the Benjamins aged between 7-9 years, the Cadets aged 9-14 years, the 15-19 category is known as juniors and the seniors from 20-39 years old. According to Chape, the BAFS plans to add a veteran’s category in the future which will include adults from 40 year plus. Chape, Karabo Thobega and Modise are the only trained officials to umpire and coach fencing sport. The three were sent for training in Senegal a few years ago. BAFS rank athletes before considering them for national team. The tournament winner gains 8 points, silver medallist 6, position 3 and 4 gain 4 points apiece. 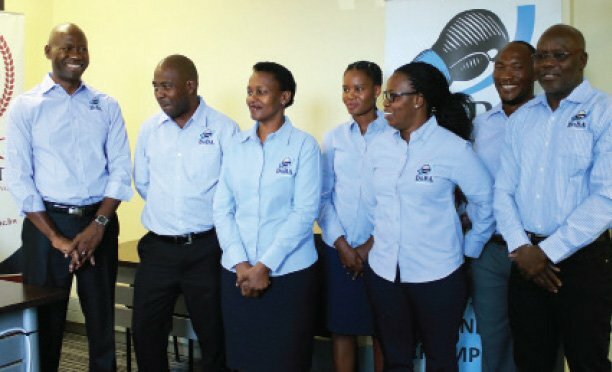 Botswana Boxing Association (BoBA) this past Tuesday officially unveiled a Local Organising Committee (LOC) that has been tasked with preparing for the upcoming Zone 4 championships that are to be held in Botswana. The team is headed by celebrated boxing legend France Mabiletsa and is expected to host more than seven countries that are expected to descend in Botswana in the next two weeks. Officiating at the event, Botswana National Sport Commission (BNSC) Vice Chairperson Tsoseletso Magang said that BoBA officials should refrain from interfering with the task given to the LOC. She noted that many sporting codes often give the LOC the responsibility of delivering an event only for the code members to bully themselves into the affairs of the LOC and disrupts the preparations. Magang warned that there is little time left before the tournament, and with that, the LOC will need all the support to ensure they deliver a successful event. She noted that hosting the regional tournament gave Botswana an upper hand of fielding more athletes that will have an opportunity to qualify for the Africa Championships scheduled for later this year. For his part, Mabiletsa noted that they have already hit the ground running and confident that the event will be a success. The competition will be hosted in Botho College and they are in talks with Ave Maria to accommodate athletes. “Life will be made much easier for athletes if they are accommodated at Ave Maria because it is closer to the competition venue,” he said. He explained that the zone is made up of 12 countries of Lesotho, Angola, Malawi, South Africa and Zimbabwe among others. However as of this past Tuesday, only seven had confirmed participation and they expect to finalize the logistics by the end of the week. Meanwhile, a formidable national boxing team of eight men captained by Mmusie Tswiiige (60kg) and three ladies led by Lethabo Modukanele (48kg) will represent the country at the regional tournament. According to the Head coach Lechedzani ‘Master’ Luza, the team has been on camp for the past three weeks. In his opinion, the team is ready to compete. “Generally, they are not bad, we need to work on a few things such as power and speed on some boxers, the defence department is also not bad,” he said. Luza noted that Botswana has always established herself as a powerhouse and there is no doubt that majority, if not all team Botswana members will win a medal during competition time. He explained that the competition was one of the many leading to Tokyo 2020 Olympics and will give local boxers an opportunity to qualify for the Olympics. Local motorcycle racing sensation Ross Branch has continued his stellar form after securing overall second position in the internationally renowned Merzouga Rally. The race came to a conclusion this past weekend and Branch has proven his mettle amongst some of the best rally motorcyclists in the world. The podium finish is expected to take the Dakar Rally racer to even greater heights in the hugely competitive and expensive sport. It has been barely two months since the talented local rider emerged as a top class racer at the Dakar Rally where he finished 13 and walked away with the fastest rookie of the 10 000 km odyssey. At Merzouga, things seemed a little better for the rider as the terrain offer sand and rock as opposed to the treacherous dunes in Dakar. Branch who was using a different navigation system in Morocco showed his pace after winning the fourth stage of the race last week Thursday. Prior to his podium finish Branch said Merzouga was only his second rally and he was willing to learn from some of the top riders in the sport. The KTM 450cc rider said he was now setting his sights on other major races including the 2020 Dakar Rally that has been confirmed for Saudi Arabia. Since returning from the Dakar, Ross has stayed busy and competed at the cross-country championship in Kwazulu Natal in South Africa, where he finished fourth. The local rider is expected to compete at the upcoming 1000 km Toyota Desert Race, an event he has won more than seven times.